LANCASTER, Pa. – Since 1875, the one-time Hamilton Watch Co. factory has stood the test of time along Columbia Avenue. Today the elaborate buildings are home to residents, a school and other businesses. And to commemorate its place in history, the iconic structure has been chosen as the 11th Lancaster Landmark Ornament, an annual fundraiser for LEADS, the all-volunteer group that provides all city holiday decorations – including the Penn Square Christmas tree – and summertime hanging flower baskets in downtown Lancaster. LEADS (Lancaster’s Economic Action for Downtown’s Success) selected the 143-year-old Hamilton Watch complex as this year’s honored landmark. Previous years included Central Market, Fulton Theatre, Watt & Shand, J.P. McCaskey High School, Lancaster Train Station, among others. The three-dimensional ornaments are renditions of structures that have played a meaningful role in Lancaster’s historic and cultural life, crafted of solid brass plated in 24-karat gold. The first phase of the Hamilton Watch complex, located on the west end of Lancaster City, was designed by architect Clarence Luther Stiles and was completed in 1875. It was the Hamilton Watch Co.’s headquarters from the company’s founding in 1892 until 1980. Twin 90-foot clock towers — the second added in 1916 — are the most dominant feature of the building. Each tower is topped with a mansard roof trimmed with copper and a clock with four faces. The four-story complex was built with brick and is shaped roughly like an ”E” with the main portion of building situated east-west, paralleling Columbia Avenue, and three wings extend north. An unconnected, four-story, Art Deco-style office building stands south of the main building located between the two clock towers. The westernmost wing of the complex was designed in a ”restrained” International style. The complex was listed on the National Register of Historic Places in 1982. The main building, designed in Second Empire style, was converted into luxury apartments and condominiums between 1983 and 2000. The three-dimensional ornaments are renditions of structures that have played a meaningful role in Lancaster’s historic and cultural life, crafted of solid brass plated in 24-karat gold, he said. The ornament can be used as a tree or window ornament or displayed in the gold foil box it comes in along with a card telling its history. Since 2012, LEADS has invested more than $40,000 to improve the city’s holiday decorations, Hulse said. Proceeds from the ornament go toward paying for that investment, he said. Ornaments can be purchased at Lancaster Galleries, 34 N. Water St.; BUiLDiNG CHARACTER, 342 N. Queen St., rear warehouses; Festoon at the Firehouse, 202 N. Duke St.; the Turkey Lady at Central Market; and the city Visitors Center on Penn Square. The ornaments also are available at Lancaster Central Market from 9 a.m. to 1 p.m. Dec. 1, 8 and 15. Each ornament is $20 and can be ordered online at http://www.LancasterLeads.org or by calling Building Character at 717-394-7201 to purchase with a major credit card. Shipping is $4.95 for the first ornament and $.95 for each additional ornament. LEADS began in 2000 when a group of volunteers created a grassroots effort to beautify downtown Lancaster. The goal has always been: make the city a more attractive place to visit, shop and live. Then, as now, LEADS is a completely volunteer organizations that operates solely from donations. Ornaments and cards can be purchased at Lancaster Galleries, 34 N. Water St.; BUiLDiNG CHARACTER, 342 N. Queen St., rear warehouses; Festoon at the Firehouse, 202 N. Duke St.; and the city Visitors Center on Penn Square, as well as Saturdays at Lancaster Central Market from 9 a.m. to 1 p.m.
LANCASTER, Pa. – The W.W. Griest Building on Lancaster Penn Square celebrates its 90th birthday and LEADS is making sure it’s a golden one. 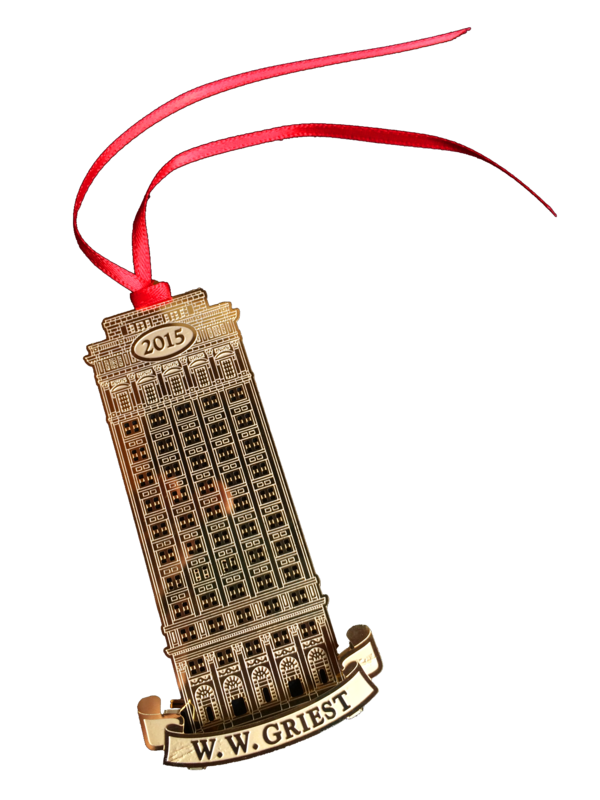 “To help underwrite the cost, we initiated a unique fundraiser – Lancaster Landmark Ornaments. Created exclusively for LEADS,” said board president Marty Hulse. The three-dimensional ornaments are renditions of structures that have played a meaningful role in Lancaster’s historic and cultural life, crafted of solid brass plated in 24-karat gold, he said. Lancaster’s Economic Action for Downtown’s Success (LEADS) has turned the iconic skyscraper into this year’s Lancaster Landmark Ornament, an eight-year tradition for the community organization that has been making downtown streets festive for the holidays since 2006. 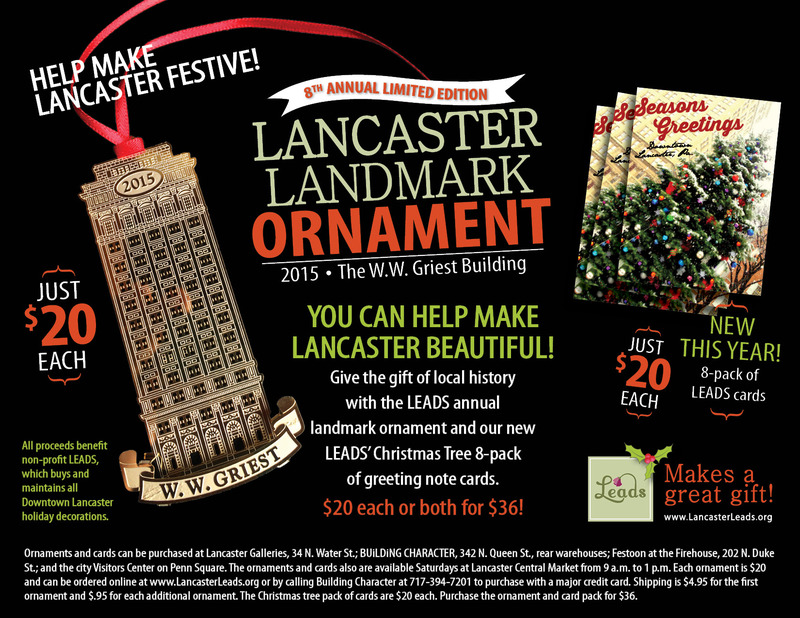 “To help underwrite the cost, we initiated a unique fundraiser – Lancaster Landmark Ornaments. Created exclusively for LEADS,” said board president Marty Hulse. The three-dimensional ornaments are renditions of structures that have played a meaningful role in Lancaster’s historic and cultural life, crafted of solid brass plated in 24-karat gold, he said. New this year is a pack of eight cards and envelopes featuring the city’s Christmas tree, which the group and city workers have been cutting, transporting and decorating the past three years. The 2015 offering was the tallest building in Lancaster until 2009 when the Marriott hotel was completed on the other side of Penn Square. At 14 stories, the building was completed in 1925 and originally held the offices of Pennsylvania Power and Light and was named for its president, William Walton Griest. Its architecture is Italian Renaissance Revival style and faced in granite, limestone and terra cotta and was designed by C. Emlen Urban. The 12th floor originally boasted a 300-seat auditorium with a frescoed ceiling of green and gold. The ornament can be used as a tree or window ornament or displayed in the beautiful gold foil box it comes in along with a card telling its history. “The past three years, we’ve spent close to $30,000 to improve the city’s holiday decorations,” Hulse said. Proceeds from the ornament go toward paying for that investment, he said. 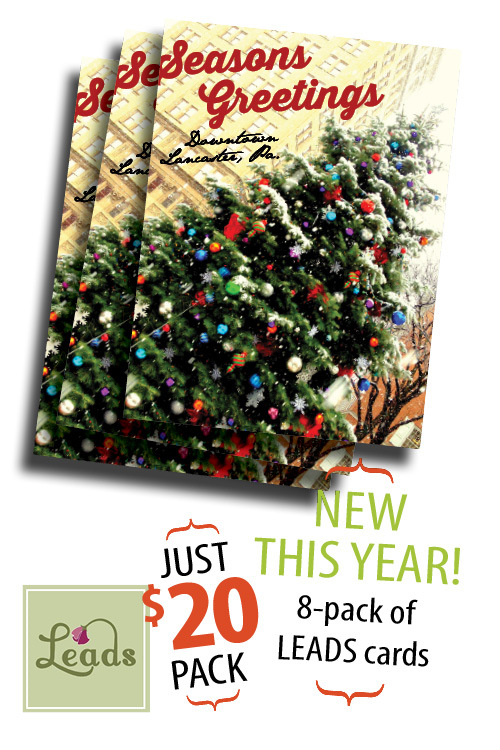 The new 8-pack of note greeting cards features the 2014 LEADS / City of Lancaster Christmas Tree on Penn Square in Downtown Lancaster. Ornaments and cards can be purchased at Lancaster Galleries, 34 N. Water St.; BUiLDiNG CHARACTER, 342 N. Queen St., rear warehouses; Festoon at the Firehouse, 202 N. Duke St.; and the city Visitors Center on Penn Square. The ornaments and cards also are available Saturdays at Lancaster Central Market from 9 a.m. to 1 p.m.
Each ornament is $20 and can be ordered online at www.LancasterLeads.org or by calling Building Character at 717-394-7201 to purchase with a major credit card. Shipping is $4.95 for the first ornament and $.95 for each additional ornament. The Christmas tree pack of cards are $20 each. Purchase the ornament and card pack for $36. LEADS began in 2000 when a group of volunteers got together to create a grassroots effort to beautify downtown Lancaster. The goal has always been: make the city a more attractive place to visit, shop and live. Then, as now, LEADS is a completely volunteer organizations that operates solely from donations.